Social media is a key channel in Recruitment Marketing, but breaking through the noise can be tough. That’s why photos and videos have become so important to reaching new followers and keeping them engaged. According to Buffer, tweets with images receive 150% more retweets. And according to Twitter, tweets with videos are 6x more likely to be retweeted than tweets with photos. Either way, if you’re social media posts are mainly text, they’re probably being lost in the twittersphere. 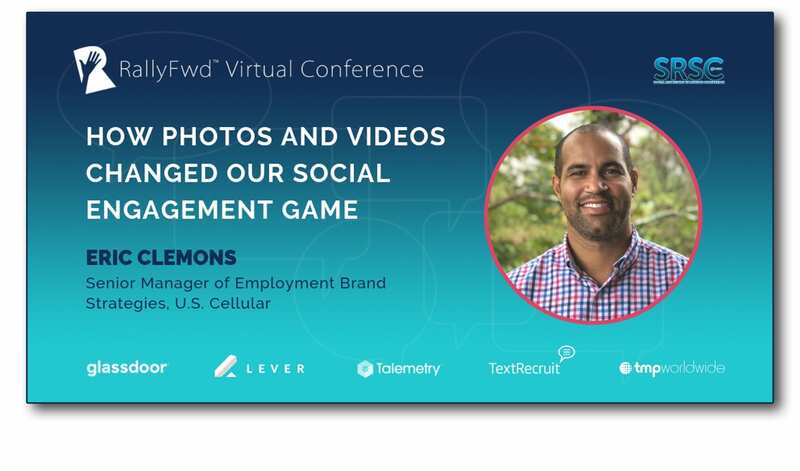 Hear how Eric Clemons, Senior Manager of Employment Brand Strategy at U.S. Cellular, changed his social engagement game using photos and videos. Eric will present what he’s learned from marketing U.S. Cellular’s employer brand and job opportunities on Twitter, Facebook and LinkedIn. He’ll show us what content gets the most engagement and drives the most clicks, and what content attracts candidates to convert. Eric will also share his tips for creating photos and video content to keep social channels full. Eric has held many roles over the last 16 years in the Telecomm industry ranging from Recruitment Marketing, to Employment Branding, to Social Recruiting and Talent Attraction. Today, Eric uses his passion to advance Talent Acquisition using Digital and Technological Strategies. Eric also has a Master of Science in Human Resources and his PHR, SMRM-CP and a Certificate in Employer Brand Leadership. Outside of work, Eric enjoys spending time with his family, playing golf and cheering for the Tennessee Vols.